On September 11th, 2017, Community Board 11 Queens tried to destroy the street safety improvements they approved at their previous General Meeting. We could not be more disappointed at the lack of commitment to neighborhood safety, the inappropriate politicking, or the lack of civic process. 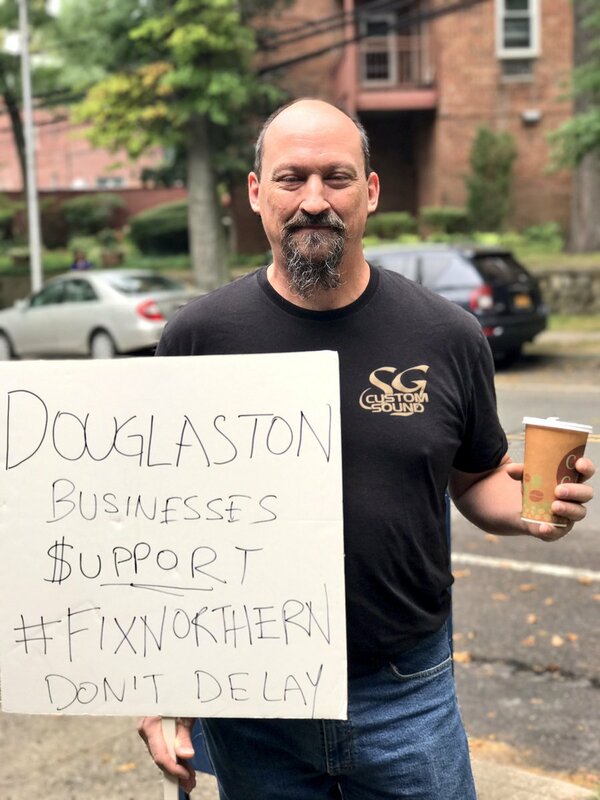 After the General Meeting on June 5th, when the Northern Boulevard enhancements were approved, an Emergency Meeting was called for July 17th (during the board’s summer recess). 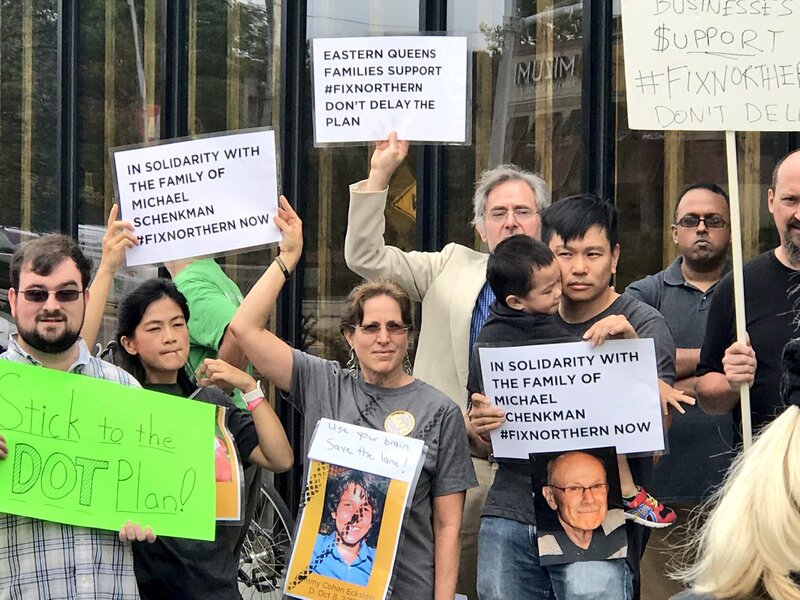 In addition to the lack of public notice or allowed participation, the meeting had questionable urgency since it was called under the guise of a “new” idea that Community Board member Bernie Haber already proposed at multiple community board meetings. The only vote at the Emergency Meeting was asking the DoT to study Bernie’s ideas (which DoT had already publicly agreed to do when Bernie proposed them at the June meeting). This was not a Public Hearing, as was necessary for the original bike lane proposal. There was no mention of bringing Bernie’s ideas to a General Meeting without a professional study being done. Sometime after the Emergency Meeting, Bernie had a secret meeting with DoT that neither the public, the full community board, nor even the the transportation committee was invited to. 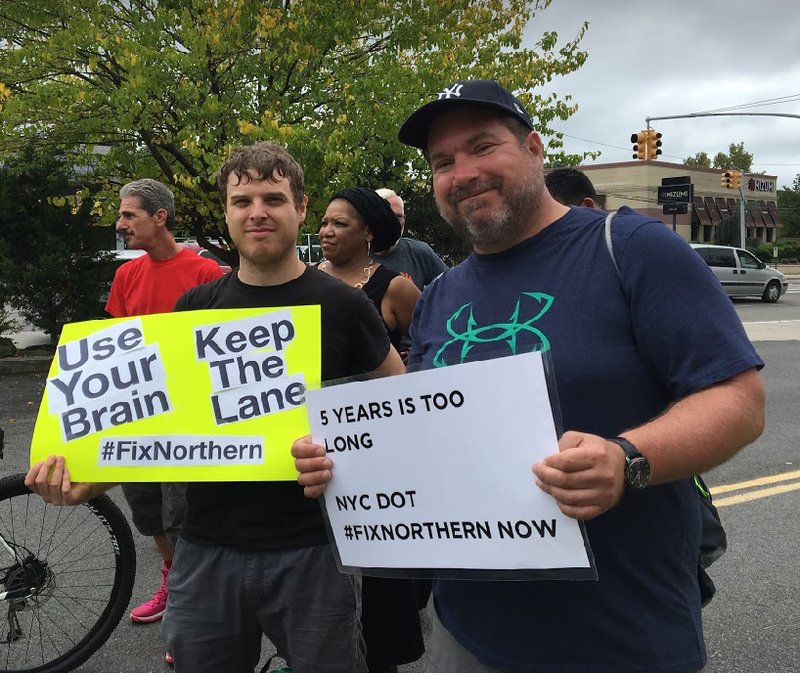 It is unclear what was said at this meeting (minutes are not posted on the Community Board website), but it has been stated that the focus was the Northern Boulevard protected bike lanes. 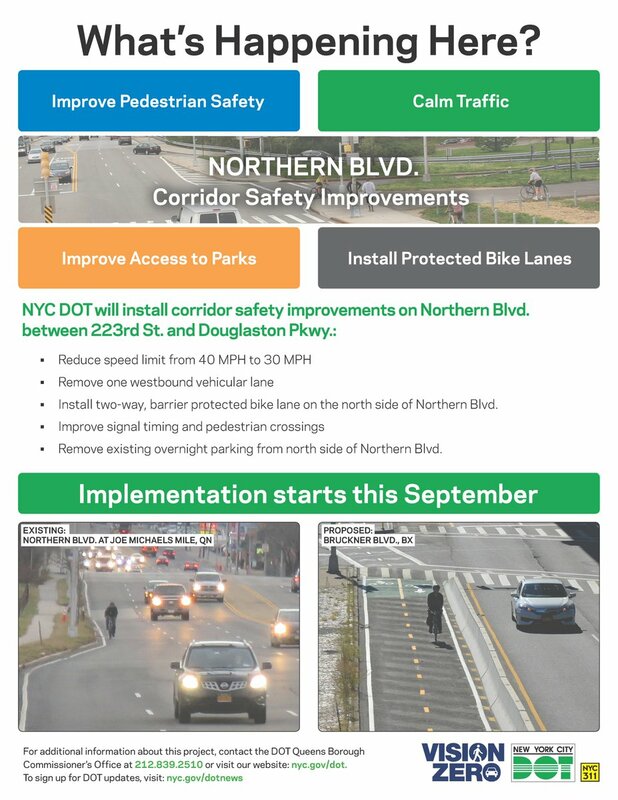 The announcement for the September 11th General Meeting made no mention that the Northern Boulevard DoT project would be repealed and replaced with Bernie’s ideas. At the meeting Bernie was allowed to express his ideas again and immediately afterwards the DoT designed bike lanes were rescinded without any discussion allowed to defend them or challenge Bernie’s claims. Bernie’s ideas do not seem to be an honest attempt to help cyclists and pedestrians; the main focus seems to be keeping the status quo for drivers. It needlessly mixes cyclists and pedestrians, it does not have a physical barrier to stop cars, and it does nothing to improve the safety around the on/off-ramps to the highway. The only thing it does well is shelter drivers from any change, even positive change like the decrease in wait time drivers will have at intersections (included in the DoT plan, but not Bernie’s plan). Bernie goes so far as to insult local cyclists/pedestrians, saying that the only use for these improvements is for “recreation”. At the September 11th meeting, Bernie claimed that his ideas would cost less then the DoT’s plan. The DoT showed that was not true since their plan is mainly thermoplastic/paint and jersey barriers, where Bernie’s plan involved taking land from multiple agencies, destroying the roots of Parks Department trees, moving light posts, pouring over half a mile of new concrete and (in an earlier version) extending the width of a bridge. Bernie also claimed that by closing 1 out of 3 lanes, 1/3rd of cars and buses will not be able to reach their destination (flip-flopping from what he said previously, that removing 1 west bound lane not would create a problem). This simplistic view is not how traffic engineering works; it overlooks current capacity, road design, and the other changes DoT is implementing. 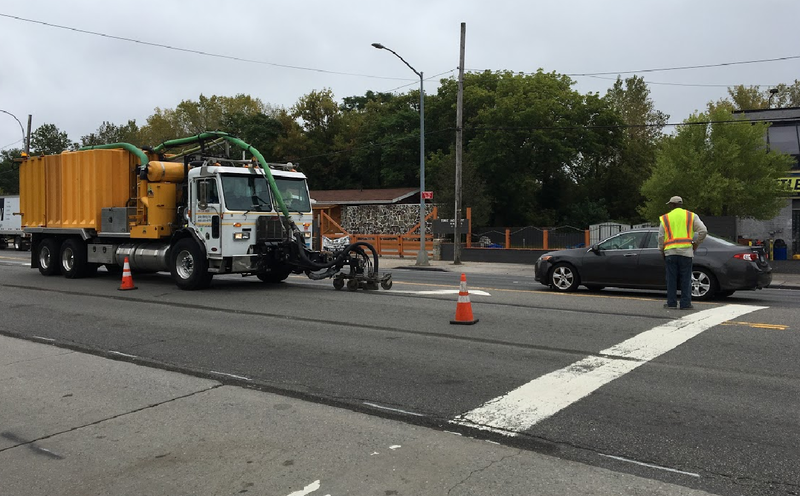 Through out all of these specious claims, the DoT representatives present repeatedly said that they have already begun implementing the plan approved by the Community Board at the June 5th meeting, making this discussion pointless. Contracts have already been awarded and construction has already been scheduled. Despite this, the Community Board still decided to repeal and replace the DoT designed Northern Boulevard bike lanes with Bernie’s ideas. Unfortunately the DoT was interrupted and shouted down by board members multiple times. The new proposal was rushed through with little time for discussion of its major safety flaws. Other news organizations have also covered the CB11 general meeting including Streetsblog, QNS, Queens Chronicle, and the Queens Tribune. It is important that the Community Board realizes that citizens are watching and that back-room plans are not acceptable behavior anymore. Only a few days later on September 15th the DoT was true to its word and began working on the original plan Community Board 11 had approved in June. 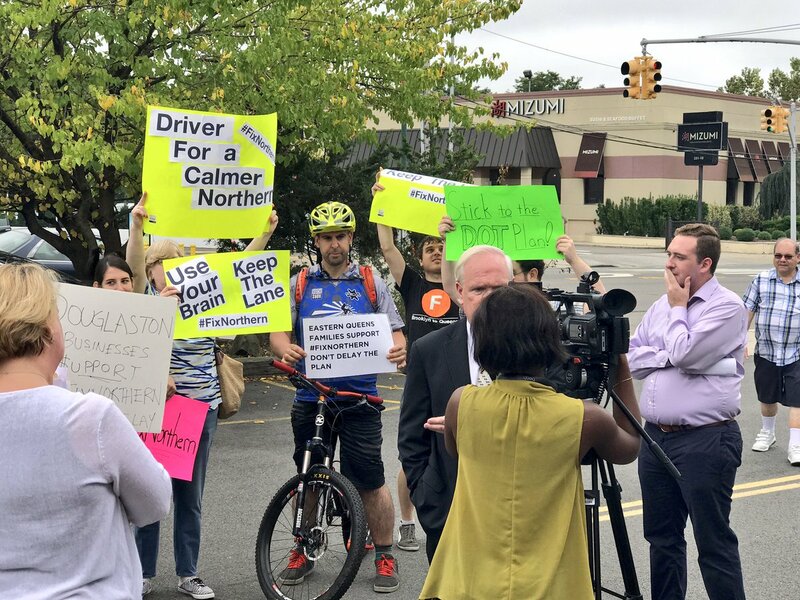 On September 18th, State Senator Tony Avella organized a rally to stop DoT’s plan and support Bernie’s ideas for Northern Boulevard, even though DoT had already begun construction on the original plan. 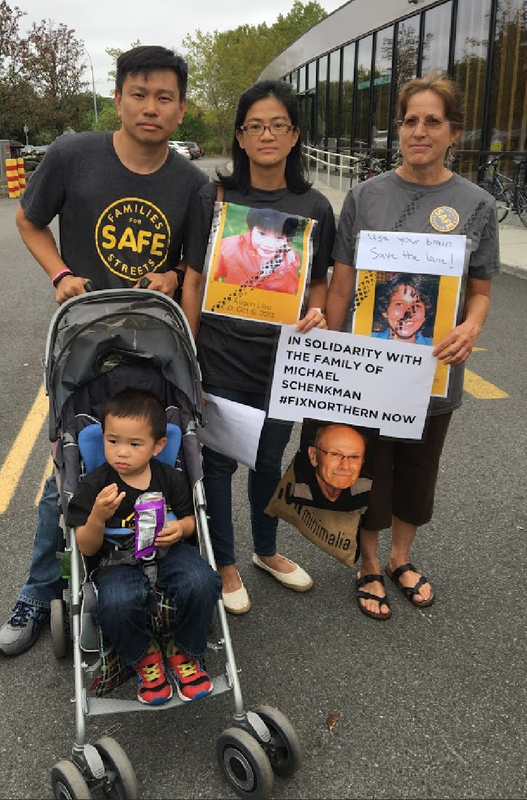 (Although State Senator Avella is the Chair of the Children and Families Committee, he did not hold a rally supporting the approval of the original DoT plan, which would have created a safe connector between children in his district and their parks.) 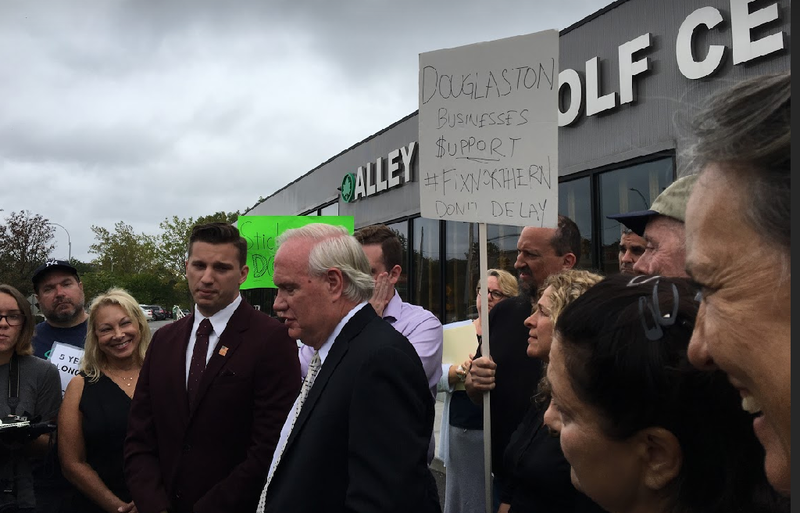 State Senator Avella’s controversial rally was scheduled to take place in the parking lot of Alley Pond Golf Center, but at the last moment was moved inside, possibly to block the news media from seeing that the counter-protesters (almost 40 in number) greatly outnumbered those supporting Bernie’s ideas (around 6 community members). At the behest of the neighbors supporting the bike lane (who for some reason were denied entry into the Parks Department owned golf faculty), State Senator Avella did the right thing and eventually moved his rally back to the publicly accessible parking lot. The rally was short, without many speakers. State Senator Avella mentioned his belief that many of the counter protesters were not from the neighborhood. Behind him local community members shook their heads and held up signs supporting the DoT’s plan, next to a petition signed by 1,239 neighbors supporting the original plan. 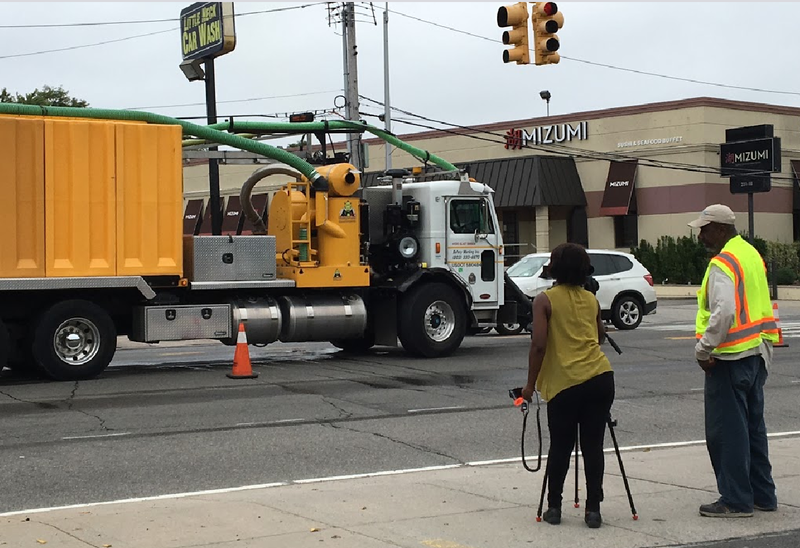 In the background you could hear DoT scraping up old markings so the new and improved safety infrastructure could be built. We care about street safety and good government. We don’t care for titles or status, or even getting accolades for what we’re doing. 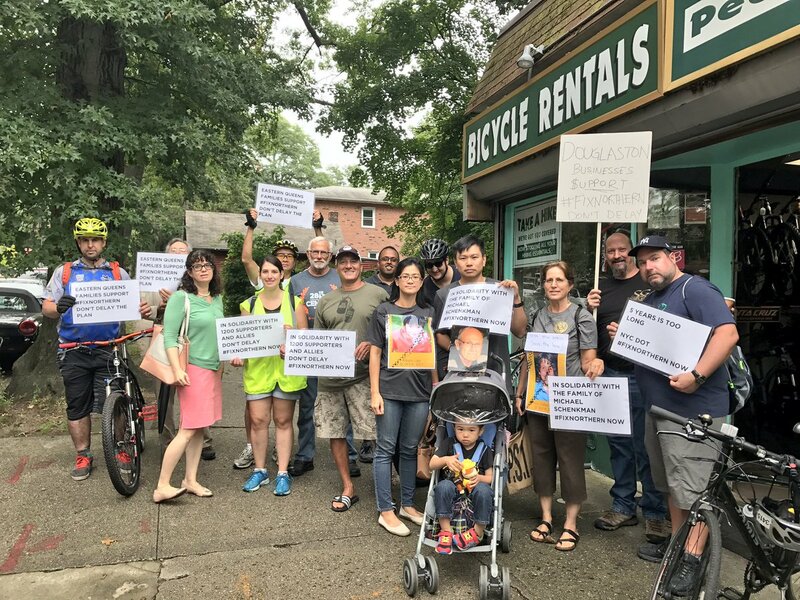 The threats of ripping out an vital bike lane before it’s built gave us no other options then to stand up for our neighbors and set the record strait. Even after these conflicts, we hope to work with Community Board 11, State Senator Avella, and everyone else who disagreed with us because our children’s lives are more important then our politics.